You don't have to be a famous coach or a local star to do this. I was only a third-team "All County" Player my senior year in high school, and I didn't even play college ball, unless you count intramurals. So don't worry that you have to be a big hotshot "somebody" in your area. You do have to know the game, though. The kids are looking up to you to teach them, and the parents are willing to pay you, so you have to know the skills and be able to teach them. If you are famous in your area, that's even better. I've seen where top coaches and ex-players can get big bucks for lessons. But all you really need is knowledge of the game and a system for marketing and doing your lessons. You can do general skills development, or specialize in one aspect of the game. I emphasize shooting (as you know, basic shooting skills have just about disappeared these days, and I like helping kids become better shooters), but I also work on dribbling and passing. Each player is different, so you'll adapt the lessons according to the skill level of each player. That Requires Almost No "Selling"
When I first found out about this type of thing (offering private lessons to kids), I did a lot of digging and found out that it's happening all over the country, in all sports. And you don't have to live in a big city or a heavy populated area to make a lot of money. Why?...Because parents are looking for this and want it for their kids. Everywhere. I've made $35 per hour (per player) teaching basketball lessons in my area. You might even be able to make double or triple that if you live in an upscale area. (I've seen some coaches make well over $100 per hour!). I've averaged 3 to 5 kids for my lessons on Saturdays. So that's between $105.00 and $175.00 for 3 to 5 hours of work fun! ($35 x 3 kids = $105.00 or $35 x 5 kids = $175.00). Not bad for a Saturday afternoon. If you want to go for more, it all depends on how much time you can get to use the gym and how much money you want to do. It's up to you. Me?... I like a small number of kids to work with at any given time. That way, I get to know each one really well and can focus on each one to give them attention for their own unique needs. It's also important to build relationships with a few parents and players at a time, where you can have a select few come back to you week after week. 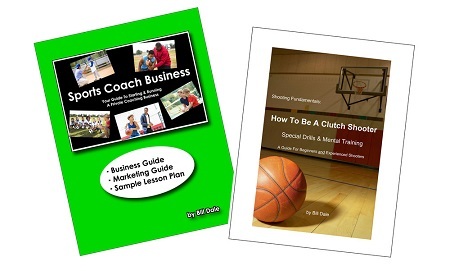 So you can get your coaching business on auto-pilot, where you know who's coming to you week after week in a set schedule. And most of the players who sign up with you will come back week after week. The players want to keep coming back so they can get better, and the parents want to give their kids the best possible advantage they can. When you help them, they will actually look forward to giving you money. You really don't have to do any "selling" at all.